Idaho Botanical Garden: Scarecrow Stroll 2009 Winners! There are many reasons why fall is a beautiful time to venture out into the Garden. As Ann mentioned in the last entry, the leaves have turned brilliant shades of orange, red and yellow and against a clear blue sky, they boldly announce the changing season in the Treasure Valley. Preparation and excitement for winter and our Winter Garden aGlow event is also felt as lights are strung in elaborate designs throughout the Garden trees and décor. And for a second year, there was another reason to enjoy the Garden during the autumn months, the return of our Scarecrow Stroll! 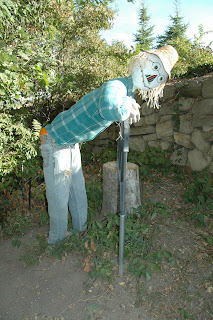 Twenty-four scarecrows peeked around bushes and trees, welcoming guests throughout October. Created by local businesses, organizations and families, these scarecrows were each unique and artfully designed. I was very impressed by this year's turnout and the creative ways each scarecrow was decorated! Not only were they a festive addition to the Garden, but they also delighted hundreds of children and guests who strolled through on field trips and visits. Each guest had a chance to vote for their favorite crow and the contest began! Now that this year’s stroll has ended, the votes have been tallied and we are ready to announce the 2009 Scarecrow Stroll winners! 1st Place goes to “Nyla the Nature Nymph” created by the Brandsma Family. 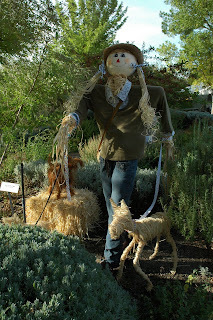 With so many fabulous scarecrows, it was hard to pick just one! 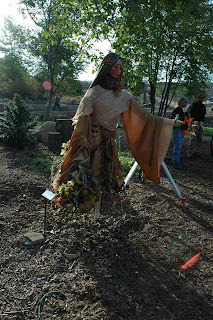 Thank you to all who participated in this year’s Scarecrow Stroll!